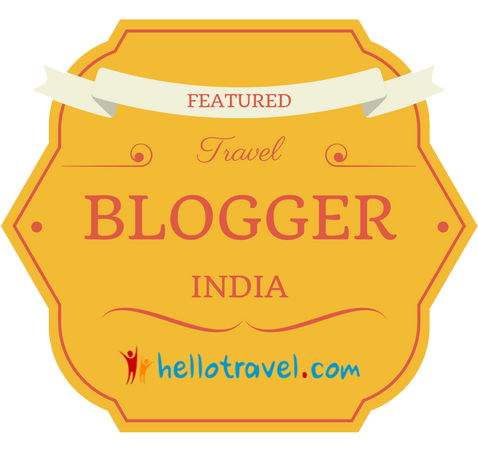 Qutub Minar or Qutb is situated near archaeologically rich Mehrauli in the South of Delhi. 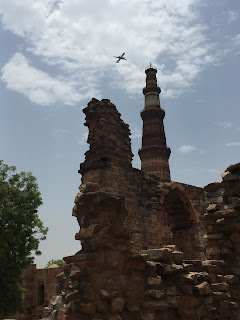 It is the worlds tallest brick minaret and the 2nd tallest minaret in India. It stands 72 meters (240 feet) tall with a diameter of 47 feet at the base and 9 feet at its peak. 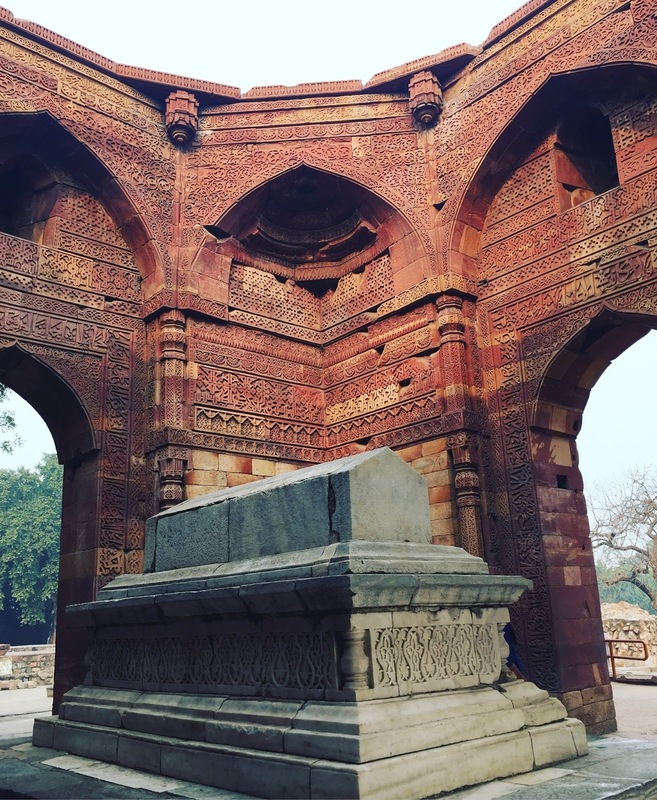 It is one of many sites within Delhi that are UNESCO world Heritage status and this one certainly deserve this accolade. 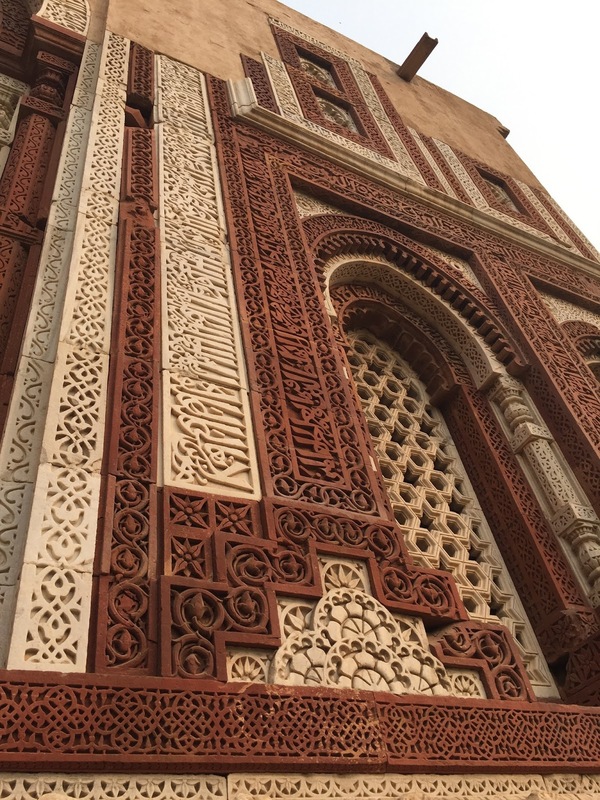 It now stands at 3 storeys in height and is made of red sandstone and marble. Decorated with beautiful deep carvings with inscriptions from the Qu'ran. Inside are 379 steps leading to the top but it is now closed to the public. It was closed after a power cut 36 years ago. On 4 Dec 1981 at 11:30 the power cut caused a stampede on the stairs. 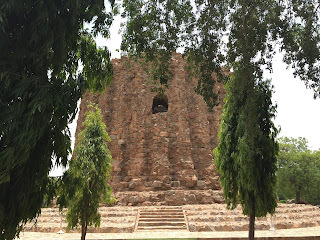 300-400 people were inside the tower, as entry was allowed to the first balcony, 29 metres up. Many were school children and students, as this is the time for school excursions. 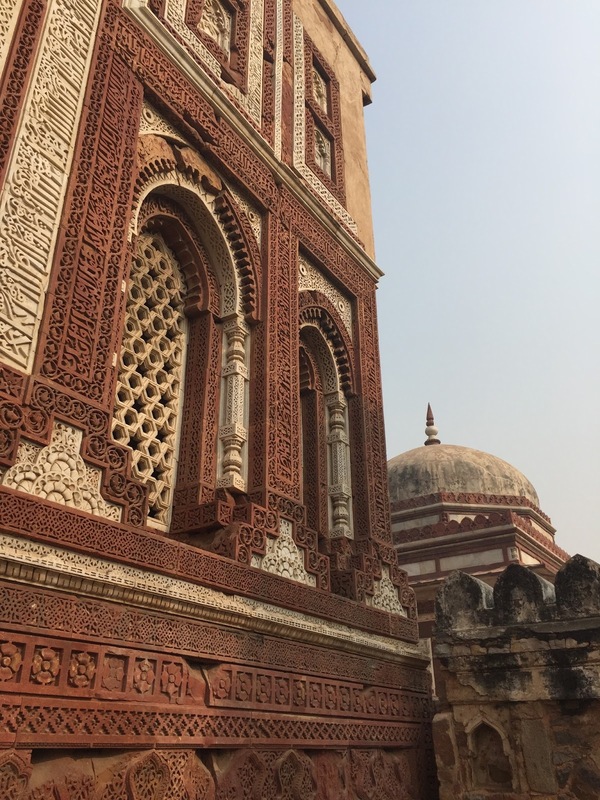 A fact that I can testify on my last visit a few days ago when the complex was awash with children running and clambering over the monuments, alike to ants on a sugar pile! 45 people were left dead and 24 injured. The tower has remained closed ever since. 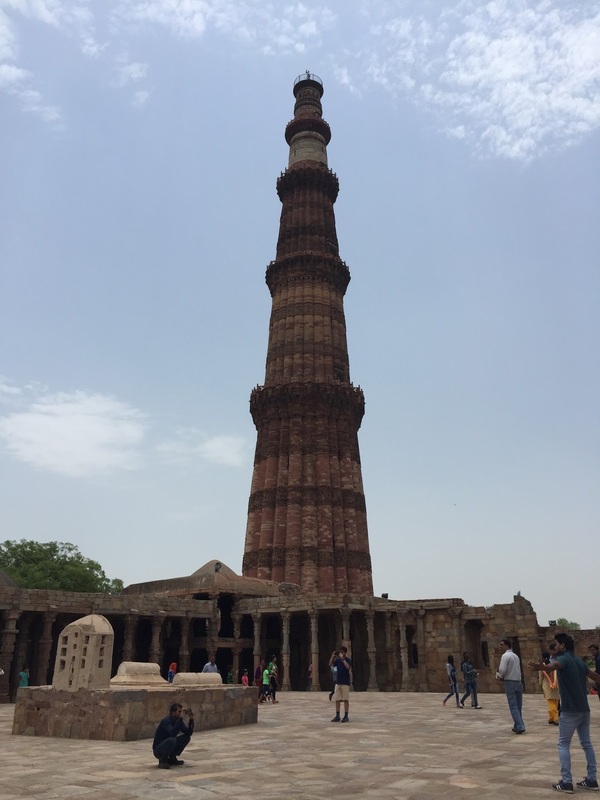 Construction on the minar started in 1192 by Qutb al-din Aibak. 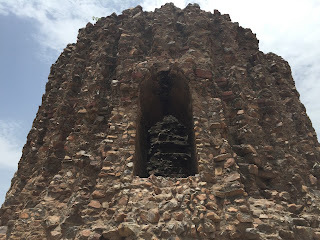 It was built on the ruins of Lal Kot (red citadel) Delhis first city built in 1060 AD, as I said the depth of history around the area is immense, you are almost falling over buildings dating back a thousand years at every step. On the 1st September another large earthquake caused significant damage to the structure. 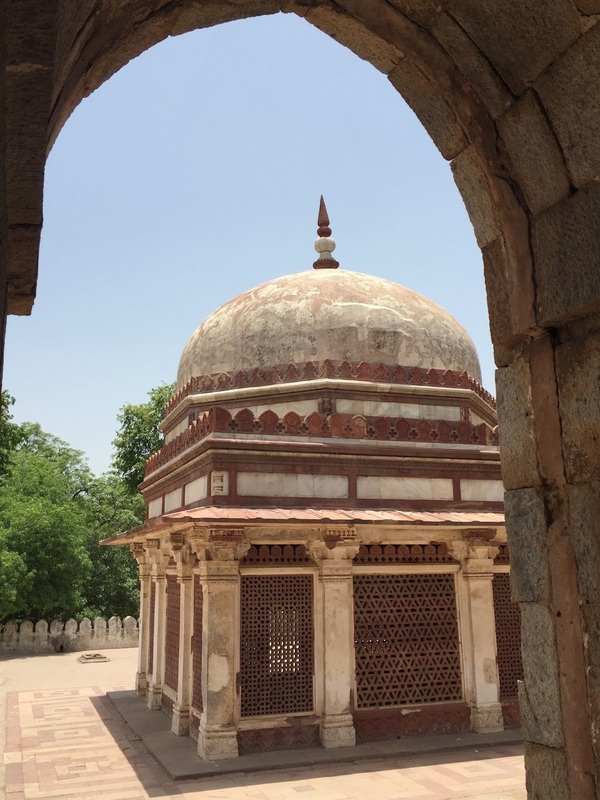 The British Indian Army major, Robert Smith added his additions to the towers reincarnations, this time by renovating after the 1803 quake and adding a cupola at the very top! The cupola was removed and now sits within the grounds close by. The Qutub minar sits surrounded by many other interesting buildings on the complex. Just next to it stands the Ala'i-Darwaza, the southern Gateway. 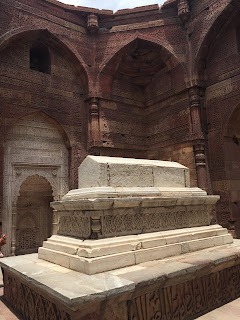 Another impressive red sandstone and marble structure decorated again in fine deep cut engravings and, I can testify, gives much wanted shade and a cooling breeze from the ferocious sun of India's mid summer. This was built in 1311 by Alau'd-din Khalji. 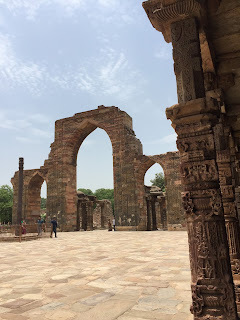 On the opposite side of the complex sits the ruins/remains of another minar, which was due to be built by Khalji but, for whatever reason, was never completed. The Ala'i Minar if it had been completed, would of been twice the size of Qutub Minar. Now only a small portion remains, a climbing draw for all the school children and a reason for the guards to keep blowing their whistles to discourage them! Between these two minars are the remains of a large substantial mosque. Reported to have been the first mosque built in India, that of Quwwat-ul-islam mosque. It is reported that it was built using the remains of 27 Hindu temples, a fact that I'm sure caused much displeasure at the time. There is a belief that the structure was in place before the Hindu emperors ruled. 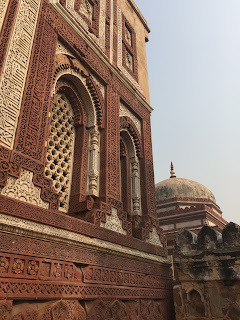 There are stones that are now in a museum which were removed that have on one side Hindu gods engraved upon them and the other with Arabic inscriptions. Whatever the origins of the building it is known that Iltutmush added to the mosque in 1230 and Khalji in 1315. 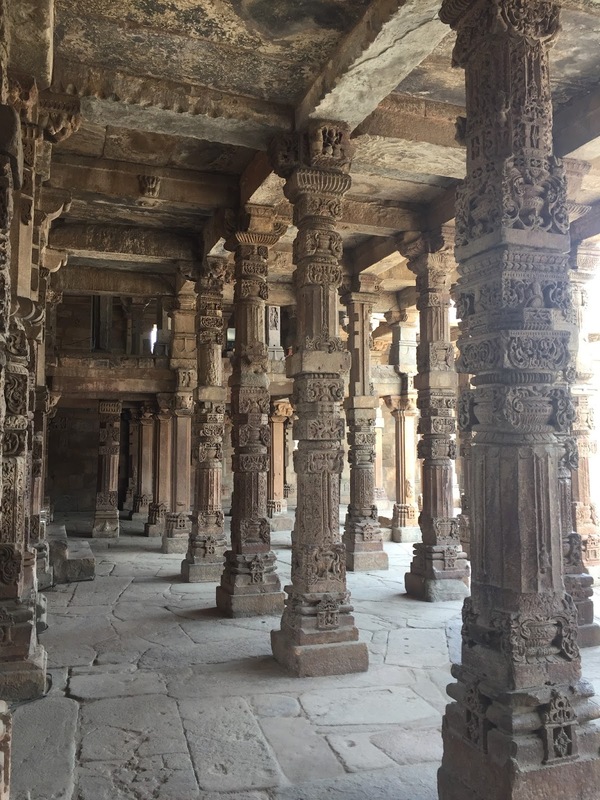 The walkways around the edge are constructed with numerous stone pillars, each unique in their carvings and reminiscent of those temples found in Cambodia. In the open square of the mosque, where sit a few cenotaphs, is also the famous 'Iron Pillar of Delhi' This 7 metre tall pillar dates back to the Gupta Empire of the 4th century, defying the odds and never rusting away. Although in the past few years there is concern over its condition, maybe another nod towards the pollutions levels here in Delhi. On the pillar is an inscription in Sanskrit and it was thought that once a garuda would of sat upon the top. 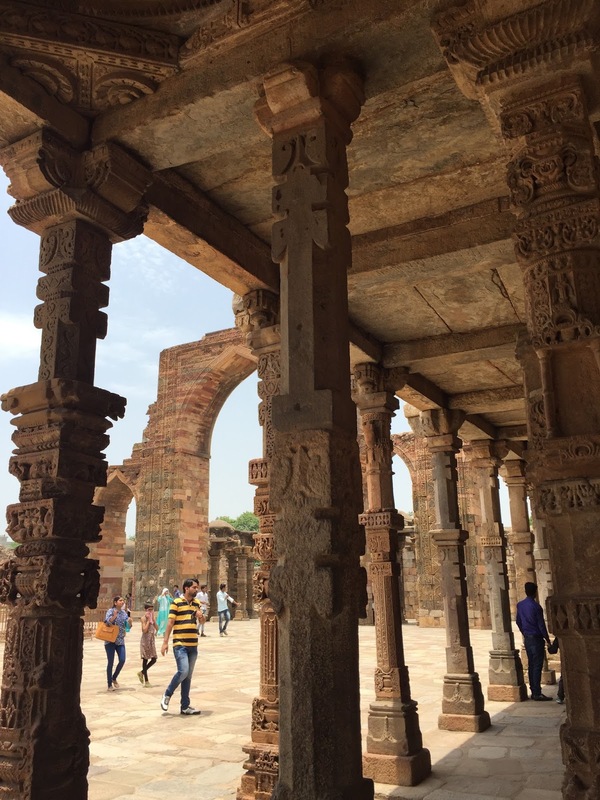 Its believed that your wishes will be granted if you stand with your back against the pillar and can reach behind you and touch your hands around the pillar. This will no longer be possible with the pillar fenced off and the ever diligent guard, with yes another whistle, watching over! There are many other structures, tombs, cenotaphs and mosques on the complex but the last I will mention is the Tomb to Iltutmush, who contributed much to the evolution of the site. Iltutmush (1211-36) himself built the tomb in 1235 and it would of once had a dome over but this collapsed, was later replaced by Tughlaq but collapsed again. Now open to the sun and stars it is a draw to many thousand photographers.